What is an appropriate monument for the current city of Philadelphia? To reflect on this line of inquiry, Monument Lab – a research team led by Ken Lum (Professor and Chair, Fine Arts Department at PennDesign) and Paul Farber (Artistic Director, Monument Lab; Lecturer, Fine Arts and Urban Studies), with collaborators in the School of Arts and Sciences, PennDesign, Penn Libraries, Penn Institute for Urban Research, Price Lab for Digital Humanities, and dozens of other municipal partners across the city – staged a two-month citywide public art and history exhibition with Mural Arts Philadelphia last Fall. Over 200,000 people engaged with the exhibition across the city, which featured prototype monuments at City Hall, iconic public squares, and neighborhood parks, as imagined by leading public artists focused on themes of social justice and solidarity. Additionally, Monument Lab opened adjacent learning labs at these sites which were operated by teams consisting of local educators, high school fellows, and Penn students enrolled in a Netter Center-supported class "Civic Studio course." Through their efforts, close to 5,000 speculative public monument proposals were gathered from participants. As an outcome to this exhibition, the research team will produce a forthcoming Report to the City, share an open data set of all of the proposals on OpenDataPhilly, and extend learnings with continued collaborative installations and projects in cities aimed at unearthing the next generation of monuments. 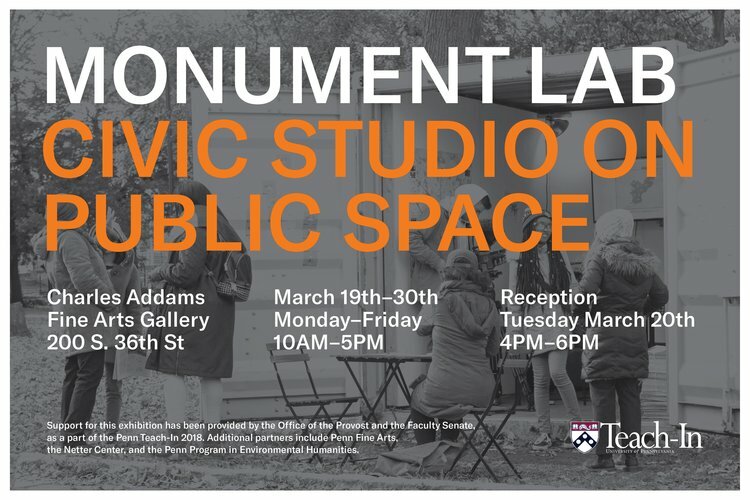 The exhibition was hosted in the Charles Addams Fine Arts Gallery, and was open 10:00am-5:00pm each day of the teach-in, with an opening reception on Tuesday, March 20th from 4PM-6PM.